My kitchen is very familiar with unitaskers - Alton Brown’s name for kitchen appliances that serve only one function. In Alton’s world they are reviled, but in mine they are an all-too-common occurrence. That is why, when I come across a unitasker that catches my eye, I walk away as quickly as I can. I simply don’t have room in my apartment kitchen, nor in my kitchen budget, for every kitchen tool known to man, no matter how much I would actually like to own them all. This policy of limiting unitaskers is why I first walked away from the aebleskiver pan, and then again and again, until finally after at least a year of lusting after it, I gave in. It’s small, it won’t take up too much room, I love weekend breakfasts made at home, it was purchased with a gift card – these are the justifications that convinced me I could make room for just one more pan. After three weekends in a row of Saturday-morning aebleskivers, I can fully endorse the purchase of one more unitasker. Go for it. This round, filled pancakes make such a delicious breakfast and they appear much more impressive to your guests than their easy preparation would lead you to expect. 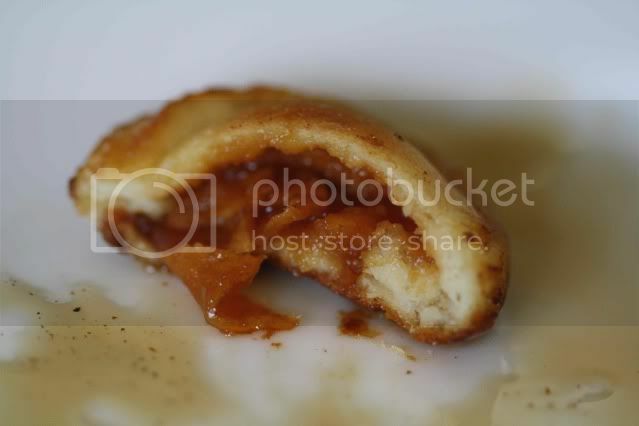 I experimented with three different fillings over the course of those three weekends including an involved apple tarte tatin recipe courtesy of Williams-Sonoma and a delicious apple butter purchased at an orchard back East. I am thrilled that the favorite filling to date is nothing more than Bonne Maman raspberry preserves. No work needed for the filling means these Danish treats are even easier to prepare. So go forth and purchase a unitasker. Even if you don’t have Alton’s blessing, you certainly have mine. In a medium bowl beat the egg yolks and sugar until light in color. Combine the remaining dry ingredients and add to the egg mixture. Mix in the milk and oil, alternating between the two. In a separate bowl, beat the egg whites until stiff and fold them into the batter. Place the aebleskiver pan over medium heat and grease the indentations with butter. Place one tablespoon of batter in each indentation, top with a teaspoon of filling (your choice) and finish with another tablespoon of batter. Let cook for 3 – 4 minutes until the bottoms are beginning to turn a nice golden brown (the only way to tell is to try flipping one). Use two skewers or chopsticks to flip the aebleskivers by pushing down on one side with one skewer while simultaneously pulling up on the other side with the other skewer. If this makes no sense, watch this video. Let the aebleskivers cook for 2 – 3 minutes more after flipping. Serve immediately with a dusting of powdered sugar and some maple syrup. Is this like the Pancake Puff pan on the infomercials? 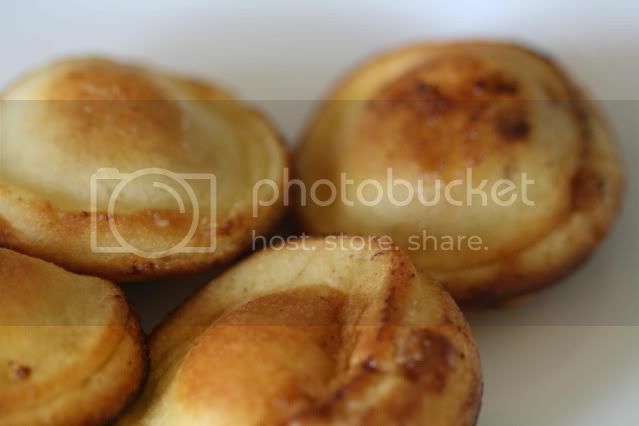 I've been wanting to make Aebleskivers for a long time, but have not purchased the pan. Yours look excellent! I love aebleskivers, but don't have the pans - no room. We have them every year at a Scandinavian festival held in a neighboring community. Just because it's called an aebleskiver pan doesn't mean it can't be used for other things, right? I can see making cute little servings of omelette, for example. Like everyone else, I have thought about this pan hundreds of times. I just may have to go ahead an buy it and use the old "Christmas morning treat" excuse. Yours look delish! I didn't know what they were! !I never tasted one either! thanks for explaing that to us! They look wonderful & oh so delicious! It's something about unitaskers that you can't resist =) They look great! I too have read about aebleskivers before and wanted to make them, but didn't want to purchase the specialty pan. Your blog makes me reassess that. Nice post. Gosh, where would I be if my mom hadn't indulged her need for an aebleskiver pan? I have the fondest memories of a childhood filled with an endless string of sunday brunches centered around an big basket of hot aebleskivers dusted with way too much powdered sugar. Soooo good and comfy they are! Eeeeeee! Forgive me, I'm just too excited to see you posting about aebleskiver. I was an exchange student in high school in Denmark and one of my fondest memories is making aebleskiver at Christmastime with my host dad. In Denmark, they aren't filled (at least in my experience) but instead served with a sprinkling of powdered sugar and some soft jam to dip them in. We got an aebleskiver pan as a gift - my husband's family is Swedish - and love using it. Our recipe is a little different, it's yeast-risen. The first time we made aebleskivers, there was a slight disaster when the dough grew out of its container and spilled all over the fridge! Oops! These look lovely and delicious and worth the precious space the pan would take up in your cupboards. Nice blog, by the way. I shall be back. 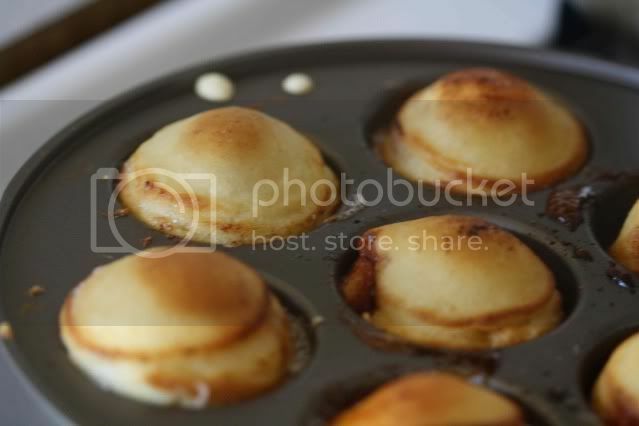 love aebleskivers, but don't have the pans - no room. We have them every year at a Scandinavian festival held in a neighboring community. Well, I never would have known about Aebleskivers if it weren't for you! Santa brought me a pan for Christmas and we are wild about these fun little pancakes. AND, bonus, I tried cooking an egg in it and it worked great! So, it's not a unitasker after all. No guilt!